Andrew: Speaking of old shows, I used to watch “The Littlest Hobo” when I was a kid. I recently discovered that the actor who plays Tigh on Battlestar Galactica was on it. Me: Really? Did he have a big afro then? Me: Oh, the new Tigh. [Followed by my own gales of laughter]. For those of you who are not BSG fans, in the original BSG, in the 70s, Colonel Tigh was played by Terry Carter – an African-American actor. 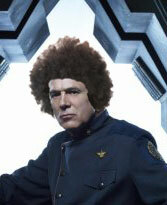 In the current BSG, Colonel Tigh is played by Michael Hogan, a balding white actor. So you can imagine the image this exchange brought to our minds. I’m watching Adam on Mythbusters sitting in a tub waiting to fart. And now they’re bringing the resulting vial of air to be tested for the gasses present. Are there some lines that shouldn’t be crossed…even in the name of science? I can’t be the only person who enjoyed Enterprise, because it did stay on the air for four seasons, and I was a bit sad to see it go. I was more sad to see it go with such a sucky finale. FOX introduced two creative new shows this season — Tru Calling and Wonderfalls. Tru Calling survived the axe by a mid-season revamp, but Wonderfalls has been cancelled. Bastards. I’m not sure how executives at FOX can hold their heads up with the crap TV they’ve invented. It’s beyond my capacity to understand how a network who has created such auspicious shows as My Big Fat Obnoxious Fiance and The Swan could can one of the two respectable new shows this season. That’s okay. I didn’t need to watch any TV anyway. There are too many good books for me to read. A few months ago, I ranted about SciFi channel’s new Battlestar Galactic miniseries, based on the things I had read on SciFi’s official BG site. I was concerned that they were going to offend fans of the show with some of the changes they made. Now that I’ve watched the show, I thought I should write some of my reactions. I haven’t decided how I feel about the miniseries — I’m torn. As a fan of the original show, I must say that this was not the original show. But then, it wasn’t trying to be. I think that if this was the only BG I’d ever watched, I might have been able to enjoy it quite a bit more. That’s not to say I didn’t enjoy this one — I did. The series was quite good. It gave much more background to the story than the original series, and made the story much more “human”. We had time to get to know the characters and their back-stories more than in the original movie. Having said that, there are some glaring differences from the original movie — and I think watching these and mulling them over was one reason I couldn’t just sit back and enjoy the new series. Not all the changes are bad or unsettling, but I wanted to catalog them nonetheless, in order to decide if I liked them or not. I liked the new cylons (though was happy to see that the machine-looking ones still had the hypnotic red eye). I’m not sure I liked that Baltar was an unwitting accomplice to the cylons — in the original he was the picture of pure evil, a conniving human looking for power. He’s too sympathetic for my tastes now. I don’t like that Starbuck is a woman. She’s not Starbuck. She might smoke a cigar, play poker, and punch a superior officer, but she is not Starbuck. They did try to give her a few campy, cheesy lines, but they didn’t work. She’s not Starbuck. I think the initial conflict between Adama and Apollo is growing on me, though I’m disappointed that Zach is already dead. I’m hopeful that Boxy will not become a major character, especially now that he’s not Apollo’s step-son. If they had to change Starbuck into a woman, I’m not happy that they changed Boomer, too. And I don’t like that she is a cyclon sleeper agent. I’d certainly watch the series, if it gets picked up, but this is not your childhood BG. I was a big fan of Battlestar Galactica when I was growing up. As a girl, I had a huge crush on Starbuck, and an only slightly smaller crush on Apollo. I would imagine myself getting caught up in some mess with the Cylons, and subsequently getting saved by Starbuck. About two years ago, I heard about Richard Hatch‘s (Apollo) vision for a new BG series where we completely ignore the existence of Galactica 1980 (if only that could be scrubbed from the brains of all who saw…). Instead, the series would pick up with the Galactica 25 years later, still searching for Earth with its rag-tag fugitive fleet. There is now a new generation who have grown up in space, and an old generation that is perhaps wearying of the journey. The idea sounded compelling. Unfortunately, SciFi is not doing this version of BG. Instead, they are doing a complete remake of the original series. They’ll be pulling some of the story lines from the original series and updating the show for a new generation of audience. Now, I will watch the new show. I’m trying not to predispose myself to hating it, but I have several concerns. Perhaps the biggest concern is that when David Eick (executive producer of the new series) was asked why they decided to make Starbuck a woman, he responded with, “In truth, there was less agonizing over this decision than you might imagine.” That answer tells me that the new producers are not in touch with fans of the original show. Starbuck was a womanizing scoundrel and every girl I knew had a huge crush on him. He was probably the favorite character among my friends (and brothers). To make such a huge change in a favorite character should take a bit of thought (and perhaps shouldn’t have even occurred to them in the first place). It would be like someone re-making the original Star Trek series and turning the Dr. McCoy or Spock characters into women. You just can’t do that. There were other answers that Eick gave on the SciFi BG “Ask David” page that put me off because it clearly showed that most of the people involved in this remake were not just not fans of the original series, but indeed had not even watched the series. While I realize that their goal is to make a new, updated version of the show, one might think they would be a bit more sensitive to the existing fans.